17 days til’ Christmas Countdown: Looking to get a gift for a friend or family members home but having trouble deciding? Below are great holiday gift ideas that are functional, attractive and will enhance their space! Portable Fire Pit – The Manta Ray Fire Pit is a portable fire pit that can be used all year around. Used outdoors its has a protective coating keeping it safe from the elements. It will last a long time and is excellent for staying warm outdoors during the colder months. It’s beautiful winged shape gives the flame a rippling effect as the wood burns and its stylish brass plates fit well in a variety of exterior settings. Artistic Wine Racks – The Mid Century Wall Wine Rack is perfect for anyone who enjoys a combination of fine wine and modern artwork. The rack is made of a strong black wire frame that mounts to the wall and has several holders where wine bottles can be securely kept. Its neutral color will look nice in a variety of different settings and its overlapping geometric design, inspired by famous abstract artist Piet Mondrian, serves as multipurpose decor item. 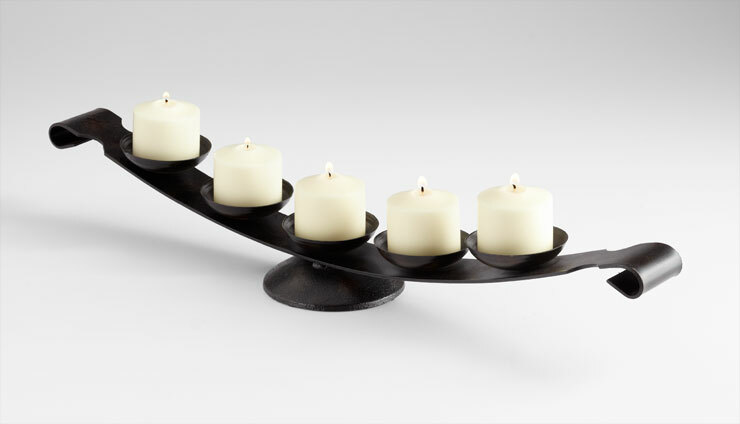 Elegant Candle Holders – The Zen Master Candle Holder makes a stylish centerpiece for a dining table or as a display item on a mantle or shelving unit in your living room decor. Made of solid iron and finished in a black bronze color, it complements a variety of design styles. Enhance this gift by pairing it with 5 beeswax or soy candles, as they are known to last longer and be better for the environment. Modern Vases – The Tube Vase I is a lovely glass vase with an elegant curve shape resembling the piston of a flower. It’s beautifully textured, jewel tone colored base adds a contemporary twist to its already captivating appeal. A wonderful choice for nature and flower lovers to be used as a decoration or as a functional design piece.